We were all so focused, and so bored. The NBA Finals. Who needs it? We want rumors. We want trades. We want all-in moves and teams getting fleeced. We miss the offseason! Leave it to GM Doc Rivers to shake things up. Yesterday, the Clippers traded Spencer Hawes and Matt Barnes to Charlotte for the artist formerly known as Lance Stephenson. Here are some rapid reactions to the trade from the Grantland basketball staff. Chris Ryan: GM DOC TAKES NO DAYS OFF. 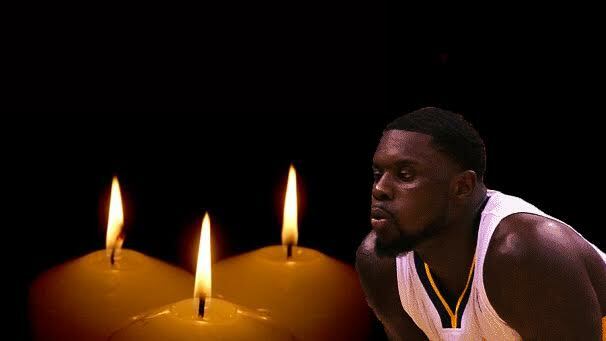 YOU CAN’T SPELL LANCE WITHOUT L-A. Jason Concepcion: ​I love this trade. It’s the physical embodiment of “beggars can’t be choosers.” The Clips have the “HARD CAPPED” warning light flashing on their dashboard and desperately need depth, playmaking, and fresh blood. L.A. traded away Matt Barnes as part of the deal and yet has somehow become potentially MORE unlikable. Lance Stephenson went from being one of the coups of Free Agency 2014 to a petulant head case shooting 17 percent from three so fast that his stock dropping actually broke the sound barrier. Meanwhile, the Hornets found the Born Ready era so toxic that they would rather pay Spencer Hawes $19 million over three seasons than Lance’s $9 million guaranteed. This is fantastic. Start the regular season next week. Ryan O’Hanlon: With that Nixonian approval rating of a 3-point percentage, will any team even bother guarding him? We’re gonna get to watch Lance PLAY BASKETBALL AGAINST HIMSELF EVERY NIGHT. May Doc the GM reign for long enough to trade for more than one of his great-grandchildren. Kirk Goldsberry: I just hope he was born ready to deal with Chris Paul. Chau: Click through to any of the tweets reporting the trade and you’ll get buried under the deluge of “… still not getting past the second round” replies. It’s as reflexive and impenetrable as a Kobe stan tweeting “Rings.” It was in response to Lance, but I’m pretty sure it would’ve been the same if they landed someone like Paul George. It doesn’t matter what happens along the journey, because the destination to ruin is fixed. The Clippers are the Escalator to Nowhere. They’re the Monorail. They’re the Popsicle Stick Skyscraper that got burned down by the 50-Foot Magnifying Glass, and they’re also the 50-Foot Magnifying Glass. Lob City is actually just Springfield, where good ideas go bad the second they’re formed. That said, this trade rules. 1. Charlotte GM Rich Cho’s statement about Hawes and Barnes: “Spencer Hawes is an experienced big man whose outside shooting gives us additional flexibility on offense. Matt Barnes is an experienced veteran who knows the NBA.” MATT BARNES KNOWS THE NBA. HE LITERALLY HAD NO BASKETBALL SKILL WORTH POINTING OUT BEYOND HIS TIME SERVED. By the way, Rich Cho is waiving Matt Barnes. 2. Thinking about Lance Stephenson as the Clippers’ backup primary ball handler in the Western Conference playoffs. 3. Thinking about Lance Stephenson doing Dion Waiters Hands at Chris Paul. 4. The fact that Doc Rivers seems totally incapable of pursuing, much less acquiring, anyone he didn’t coach or regularly coach against during his tenure in Boston. 5. The rumor that the Clippers will make a run at Paul Pierce. 6. The idea that a team with J.J. Redick, Jamal Crawford, Lance Stephenson, Austin Rivers, and Paul Pierce as its wings is going anywhere in the Western Conference. 7. The belief Doc the GM has in Doc the Coach to be the guy who figures Lance out. 8. Chris Paul’s face the first time Lance blows a game. 9. Chris Paul’s face when DeAndre Jordan signs with the Mavericks. 10. Just how nuts things can get from here. Can they sign Garnett for $12 a season? Do they trade Blake for Durant? Paul for Kyrie? J.J. Redick for Jared Dudley? IS RONDO IN THE MIX? Sean Fennessey: Last November, Zach Lowe sat down with Lance Stephenson less than one month into his ill-fated tenure with the Hornets. Stephenson, owner of a new three-year $27 million deal, was shooting a lowly 26.7 percent. At one point in the conversation, Zach asked Stephenson about his penchant for passing up good shots. On a lot of possessions, you’ll be on the weak side behind the 3-point line, someone will swing the ball to you, and you’ll be pretty wide open. But you don’t shoot. You like to hold the ball, survey the floor, and set up for a drive. You shot 35 percent from deep last year. Why don’t you just shoot? They’re good shots! So you’re aware there are some good looks you pass up? The day of the interview, Stephenson scored 17 points on 7-15 shooting, grabbed 13 rebounds, and sank a 33-foot game winner — off the glass — as time expired in a triple-overtime marathon over Atlanta. Before the final play, with 2.7 seconds remaining, Stephenson reportedly told Steve Clifford, “C’mon, coach, draw me up a play.” Stephenson was gonna shoot, and he did, and his team beat the team that would finish the season with the best record in the Eastern Conference. He played 47 minutes, and was +10. Furthermore, he smiled after the game. Stephenson was emboldened, and Zach’s interview was serendipitous. Sort of. 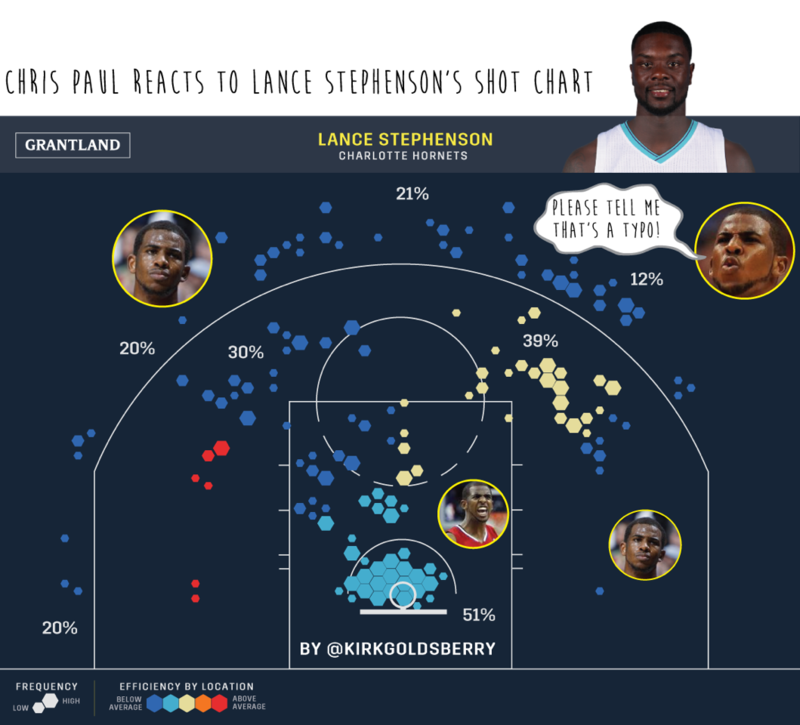 In November and early December, Stephenson went on to his best month of the season, averaging more than 10 points, seven rebounds, and five assists per game. His shooting percentage was a less-than-impressive 40 percent during that stretch, but in all other facets, he was the Swiss Army Lance — all derring-do and stoic intensity — that the Hornets had been hoping they’d so cheaply acquired over the summer. Only problem: Charlotte went 3-12 over the next month, effectively ending their season, even in the abysmal Eastern Conference, before they’d reached 2015. Such is Lance. That triple OT shot might have been the worst thing that could have ever happened to him. When he’s considered an underdog, Lance is a cloud, untouchably floating through the world — beautiful, formless, and elusive. When he is estimated properly, he is stalagmite, ground-bound and trapped in a cave of his own design. Doc Rivers is no meteorologist. He’s a miner. So maybe this might actually work out after all.